The Southwestern United States is home to countless ancient figurines, depicting beings with elongated heads, halos, antennas, almond-shaped eyes, and even what some interpret as beings in astronaut-like space suits. These figurines were created around 4,000 years ago. Holy Ghost panel in the Great Gallery, Horseshoe Canyon. Image Credit: Wikimedia Commons. 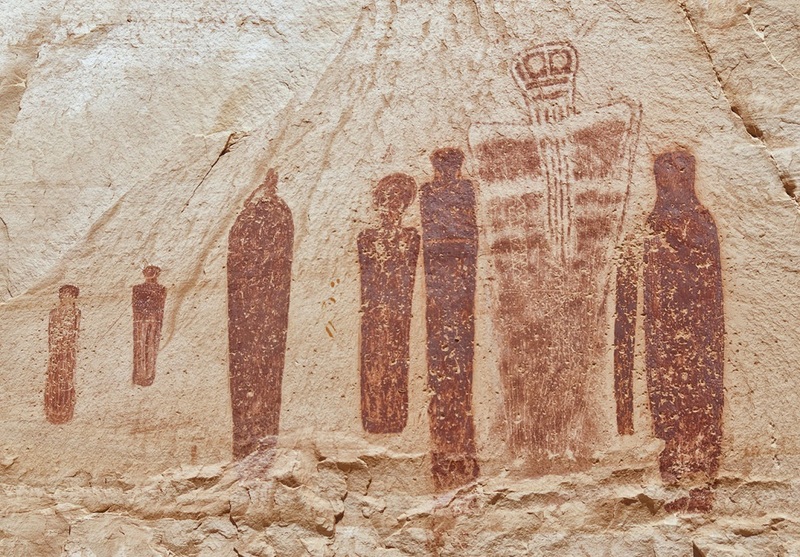 In the southwestern United States, mainly in the state of Utah, there is a great concentration of places where thousands of years ago, early inhabitants depicted strange beings with elongated heads, massive height, and helmet-like objects, as well as a number of depictions of what many authors have identified as cosmic maps. The enigmatic figures date back 1,500 and 4,000 years ago, although some could be older, while others figurines could have been created as recently as one thousand years ago. But it doesn’t matter whether they were created four thousand years ago, or two thousand years ago, what matters is the message that the ancients tried conveying. 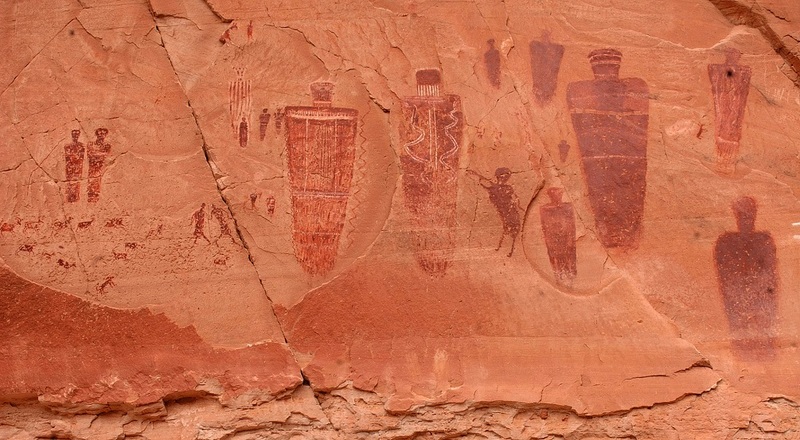 One of the greatest enigmas that experts have tried solving is the meaning of the figures painted on countless rocks in Utah. Are these mysterious representations the result of ancient man’s ingenuity? Imagination? Are these figures depictions of ancient abstract art? Or is it possible, as some authors suggest, that these mysterious beings were the so-called sky people? The most famous of all panels is located in the Horseshoe Canyon, formerly known as Barrier Canyon, west of the Verde River in the state of Utah. The rock art at horseshoe canyon is known as Barrier Canyon Style (BCS) rock art. Part of the Great Gallery. Image Credit: Wikimedia Commons. The Great Gallery is a spectacular ancient art panel of more than 60 meters in length by about 5 of height in which are represented some 20 anthropomorphic images of natural size, the largest of which exceeds 2 meters in height. The so-called great gallery is divided into two differentiated areas, so that the most separated representations, on the left, are known as the Panel of the Holy Spirit, due to the presence of an unusual-looking figure that some identity with a spirit and others with some shamanic ritual. This gallery offers the largest and best-preserved collections of Barrier Canyon Style rock art in the United States. The Great Gallery, Canyonlands National Park.Image Credit: Wikimedia Commons. This panel has been dated by optically stimulated luminescence between 400 and 1100 AD. According to experts, the pictograms of the Great Gallery were made using ocher-red color to represent more than 80 figures, whose meaning remains a profound enigma. The creation and dating of the figurines is also a problematic issue for experts because the pigments used by the ancients lacks organic material and cannot be analyzed by radiocarbon dating. The rock art of the great gallery is believed to have been the product of the Desert Archaic culture, a nomadic group of hunter-gatherers predating the Fremont and Ancestral Puebloans. Previous PostSTATUES ON MARS: Are These Relics Left by an Ancient Martian Civilisation? Former KGB Agent Reveals Soviet UFO Studies.